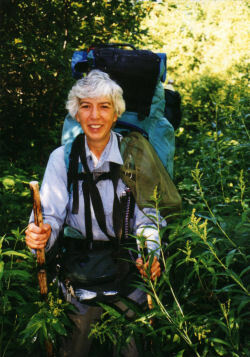 It's been a long time... since Ellen and I have been able to schedule an adventure. We were SO overdue! It rained here all week. Last night was really bad- strong winds and serious downpours. By this morning the rain had mostly moved off to the east, leaving just a lot of blustery wind. We decided to bundle up and head for the woods anyway. It was a great day! The wind was mostly in the treetops, and we walked about six miles. This is the section of North Country Trail that I maintain, so we also did trail work- cleaning up branches that were down. We had a saw with us, but only used it on a couple of small branches. 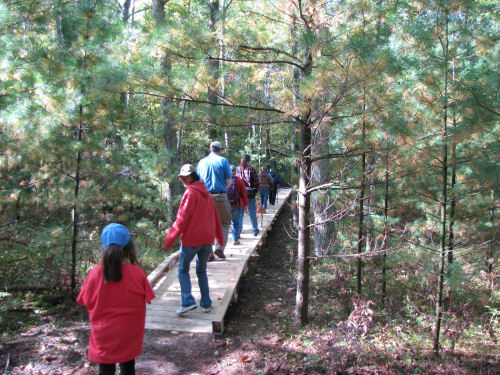 This first picture shows a boardwalk that the chapter built 12 years ago. It was our first big project. 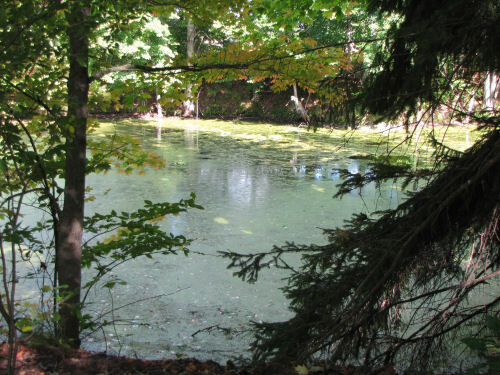 It goes 600 feet across a section of Dead Horse Marsh. I like how it has pretty much blended into the scenery, no longer looking new and raw. Was Maggie was thinking about the different and interesting scents being brought to her from the marsh, on the wind? It was a lot of fun to tell Ellen about some early projects on that section of trail. She hadn't ever hiked that piece before. I didn't realize that when we started. So I got to tell her about a place we built a re-route around a seep that kept the trail wet all the time, and another re-route where the trail had been found to be on a corner of private property. The former route has disappeared into the woods so well that you can't tell where it went unless you really knew where it was before. We also talked about some sections that need a bit of work now- treadway that is incised into the soil just because it's so old, another place where it should be moved a little bit to be in a better place for views and maintenance. We stopped by another small wetland with no name to eat our lunch. Maggie went along too. I hate to admit it, but she's awfully stiff after a hike of this length. At 13 1/2, she's not as spry as she was (are any of us?). But this will probably be her last summer for long hikes. Sounds like a group I'd like to join. But I'm about 40 years too late! 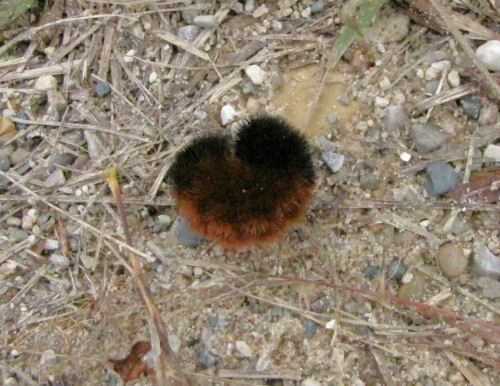 There really was an Original Society of the Friends of the Woolly Bear founded by C. H. Curran, curator of insects at the American Museum of Natural History in New York City. 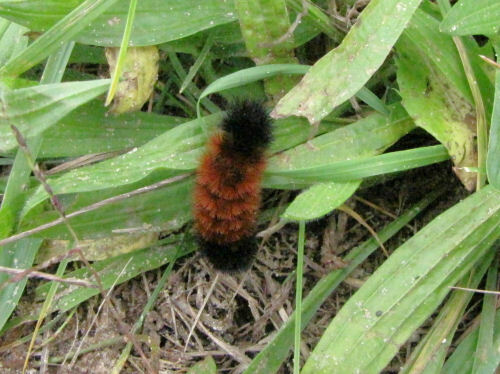 In 1948, he started studying the wooly bear caterpillar to see if there was any truth to the folk legend that says a long orange stripe on the caterpillar means a mild winter. The "study" was conducted somewhat tongue-in-cheek with the underlying purpose of having an excuse to take a fall outing up the Hudson, from New York, with his family and friends. They traveled each fall to Bear Mountain, NY. I only had to travel part way down my driveway to find this one. This one seems to have 5 orange segments. When I blogged about this caterpillar in 2009, that one had 6 orange segments. See link. Who can resist? It's so much fun to pick them up and watch them curl into a tight ball. Have you seen any this year? How many orange segments did they have? I've been crazy busy this week with work. I was assigned 22 cases. That's good for the wallet, but leaves chasing my tail. I also have several active clients for web site work at the moment, too. I was out doing assignments in the rain again today. I'll share my best wildlife sightings. 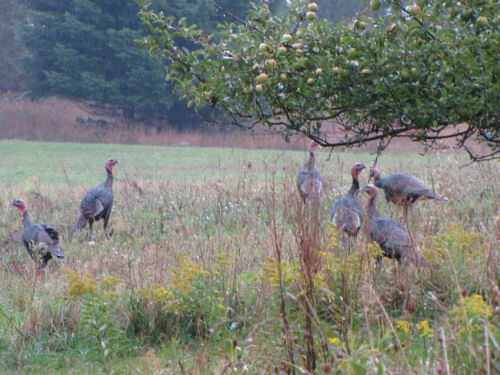 First is the wild turkey. 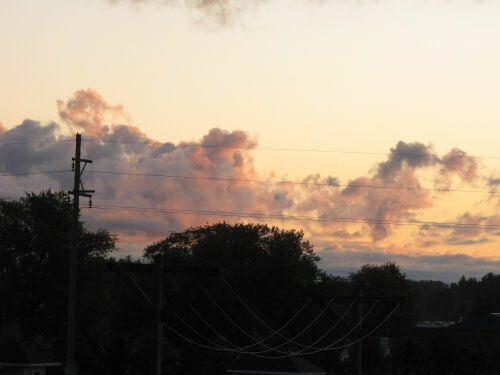 If you track any nature blogs from the Northeastern U.S., you've probably seen pictures of them before. 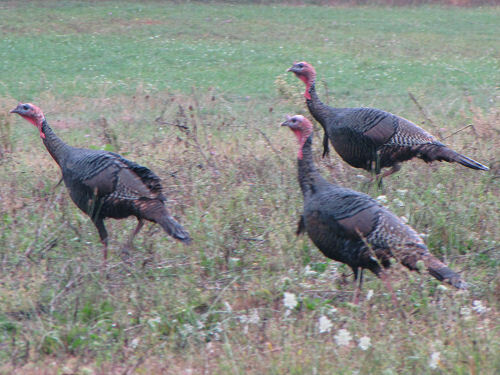 They are much funnier looking than the white domestic turkeys. These are young males. See the "beards' of feathers hanging off their chests. Most females don't have these. The "snood" - that red thing on their heads, can change colors. 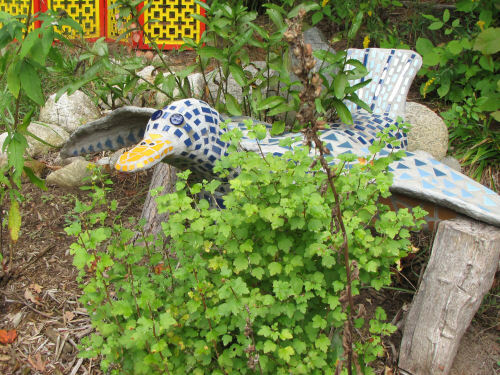 Next we have the elusive and rare wren-tailed blue duck. It's so rare, I'm speechless. Actually, I would love to feature this entire yard, but I probably shouldn't do that. The family was not home, but they have to have several crafty people. There were all kinds of decorations made with cement and small stones, colored glass, tiles, etc. There was a garden trellis gate woven of saplings and the pathway was named with twigs attached to the top bar. Baby trees were ringed with rocks. It was all quite interesting! Here's the best, though. 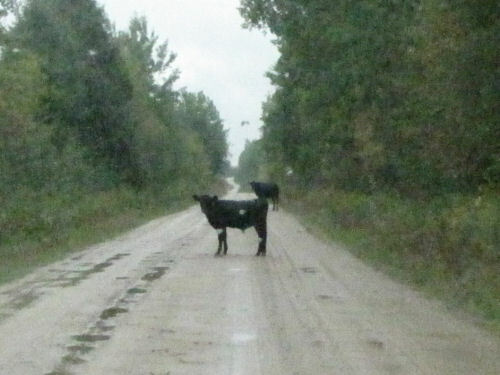 I was driving down a dirt road, in the pouring rain, and two large animals appeared in the road ahead of me. Two... black...cows. They were actually fairly dangerous to get by. Mom was considering thinking of me as a threat. They insisted on trotting along right ahead of me, and mom put herself between me and the calf. She kept looking over her shoulder at the car. I wasn't sure that she might turn and charge the car if I tried to pass. But eventually she and the calf turned off into the bushes. Hope they find their own field soon! A busy day today. Maggie and I took a short walk through the cemetery where it was less wet. Although it didn't rain, it didn't dry out from yesterday, either. I'm bringing you a plant that always makes me smile. It's alien- as in, not native to North America- but it has spread so completely from its European and Asian heritage, that it is found just about everywhere. 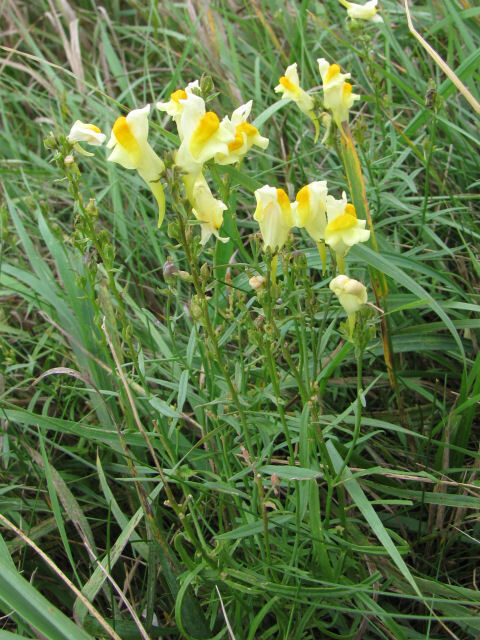 It is the common toadflax, Linaria vulgaris, usually known by the more descriptive name of butter-and-eggs. The leaves are very narrow and "messy," but it fills in a space nicely. I'd put it in a garden, I like it so much. Hey, maybe I should! The sunny colors have made this plant a favorite of mine since I was a child. I LOVE Sassafras! It's beautiful in any season, but I'll feature fall- probably no surprise. 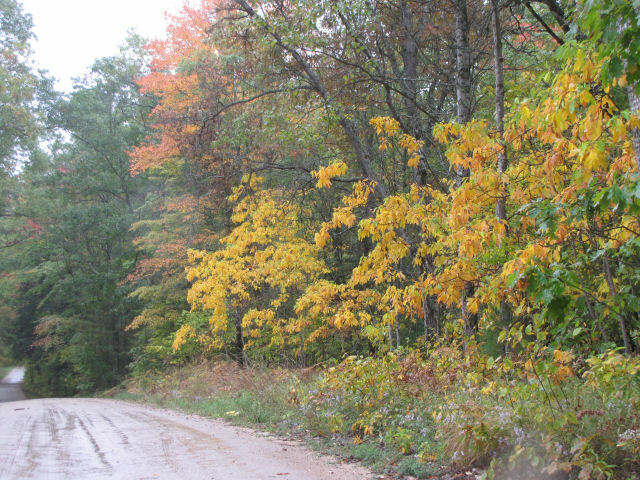 Here's the golden understory row it creates along a road. But last week I also got some nice pictures. Mostly because it wasn't raining, which it sure was today! 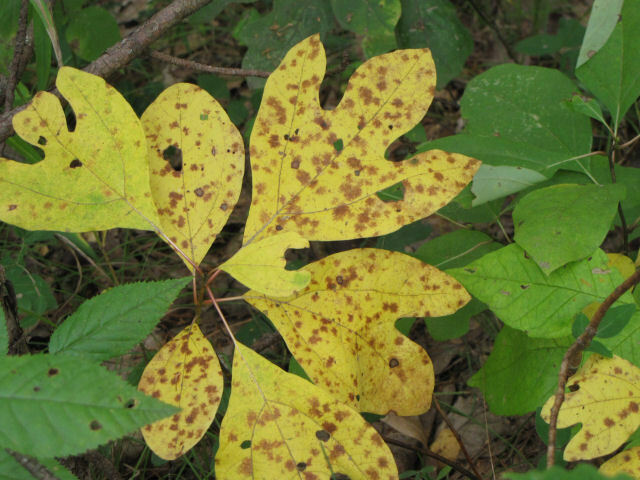 Here are the classic sassafras leaves. They come in three shapes- regular leaf shape, the classic mitten (perfect for Michigan! ), and the three-lobed ones. Here's a sight I don't find too often, though. 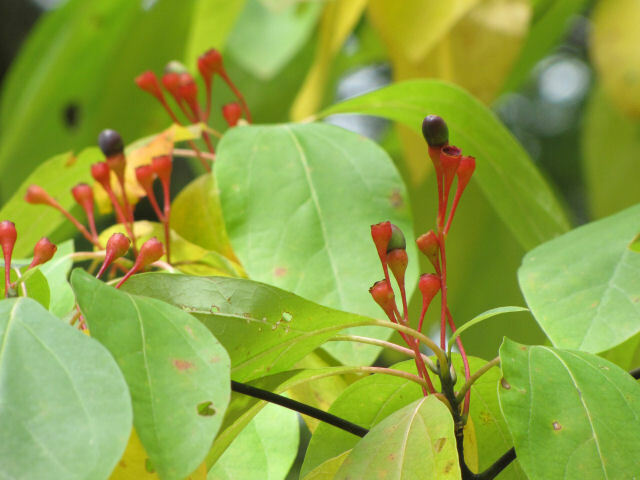 Sassafras fruits! The blue-black orbs are the fruit. The red "vases" are the stems. Birds have already eaten quite a few of these. It poured rain most of the day, and I was out doing assignments. Can't complain though- it's not too hot! This is not quite kitchenhenge. I missed the date by a day because of clouds. But it's close. This is not quite a sun pillar. The "burned-out" blob isn't the sun, which is still below the horizon. I guess it's a sun plinth (on which the pillar would be built?) 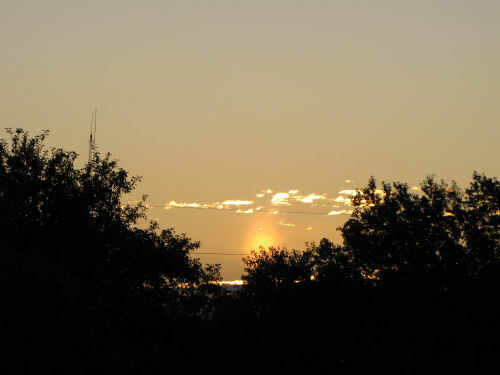 See link below for a good sun pillar. This is not quite perfect. Stupid wires. But not bad. Gray and damp all day today. Way too much to do. But this is all about quality days, so I won't worry about "not quite," I'll just enjoy that it's something. Today was the official opening celebration for that boardwalk you've been seeing pictures of for a couple of years. The last piece was completed in August, and the Forest Service threw a party today. 37 people came! 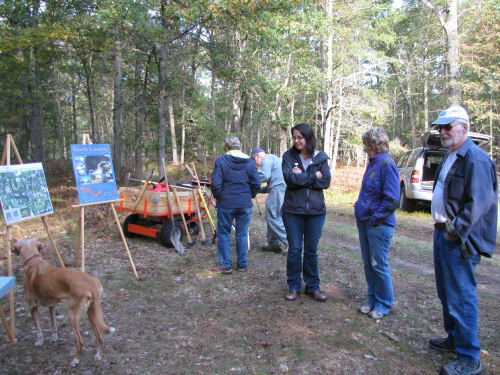 Quite a few representatives of the Forest were there, and people from our chapter. Also, the (relatively) new National Park Service Trail Manager came. 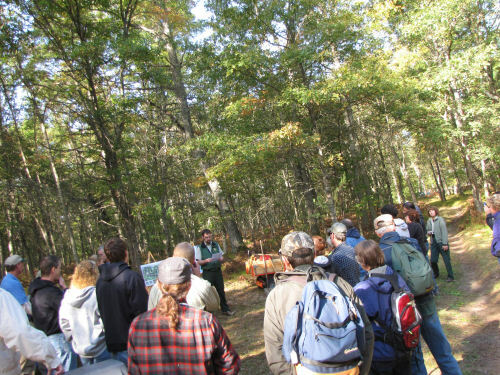 The picture above shows Dave Jaunese (Forest Service) welcoming everyone and explaining a bit about the project. 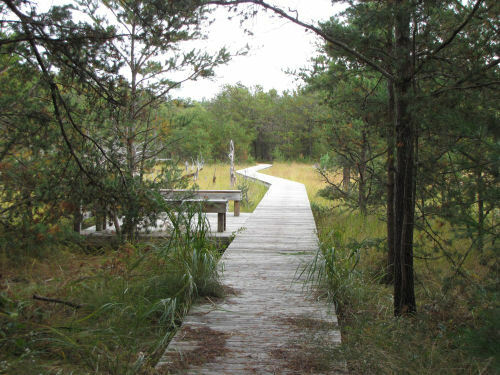 Just to remind you, or for new readers, this has been a three-year project to build over a half-mile of raised boardwalk through a wetland area known as Sterling Marsh. 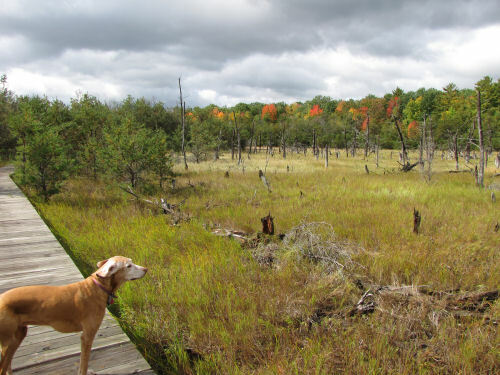 This is part of the North Country National Scenic Trail. The Forest Service brought most of the food, and the Spirit of the Woods Chapter of the North Country Trail Association brought some. The Forest Service created some nice displays with collages of scenes from the project. In this picture, Maggie is apparently checking out the displays. A couple of folks are looking at the power wagon, which was a big help in moving materials to the work sites. The other people seem to be looking at Maggie! Ah! Finally (not too long really), we took a hike to check out all thirteen sections of the boardwalk. They all have their approaches done, and have been neatly numbered! Meanwhile... there is always that last-minute scrambling behind the scenes. 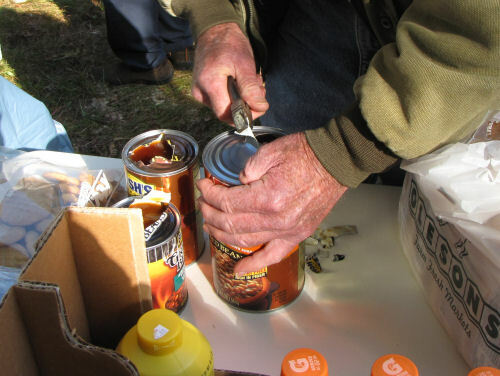 No one brought a can opener to get into the beans. Never fear! Trail folks are always resourceful, and I always have a tool box in my car. In a pinch, a screwdriver and pliers will do the trick. Maybe I'll stick a can opener in the glove box, too! Did anyone guess what the background for this fall is built from? 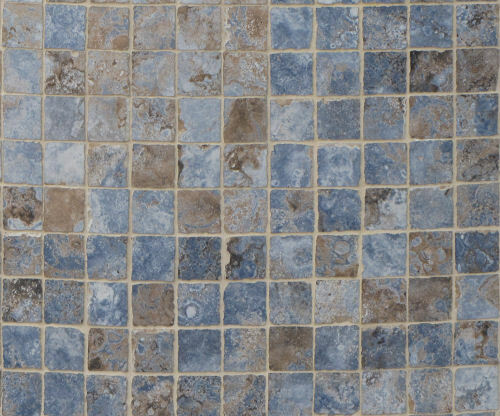 Here's the tile. I have a lot of fun playing around with pictures to make these. But this time, you might not be so thrilled with the original topic. 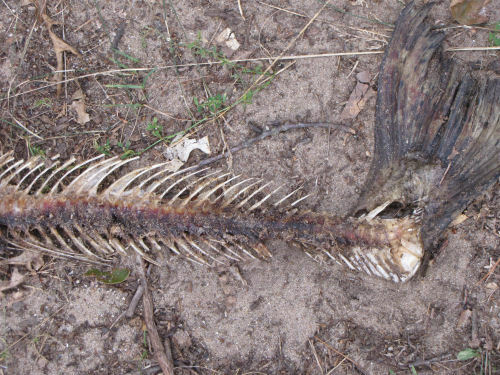 Here it is: a long-dead salmon. At least it was so well cleaned and dried that Maggie didn't even try to roll in it! A lot of the regular commenters here are taking blogging breaks, having health issues, or are on trips. You could have a free ad for a month (the small icons on the left) by leaving a few extra comments. Stay tuned for the regular daily post in an hour or so! Here's an interesting plant. I stumbled into a large patch of it yesterday. 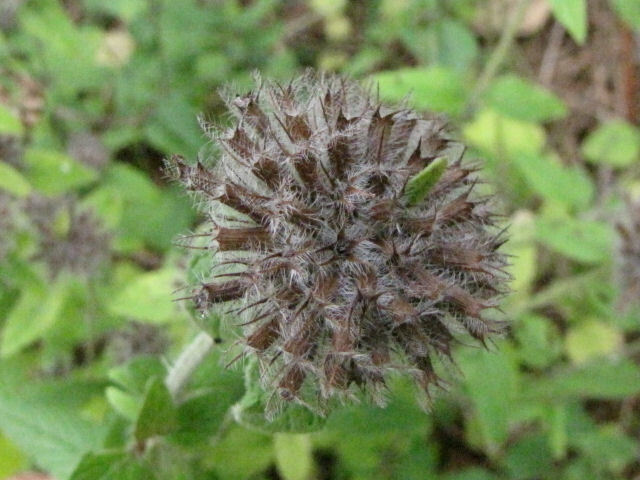 It's too late in the season to see the flowers, but the seed heads are really more interesting. In the first picture, you can see how it grows. It almost look like it has purple blossoms, doesn't it? 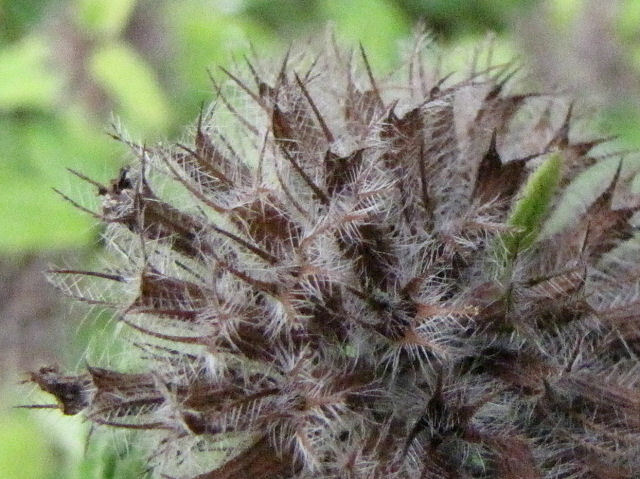 But those are the seedheads. Here's one a little closer. 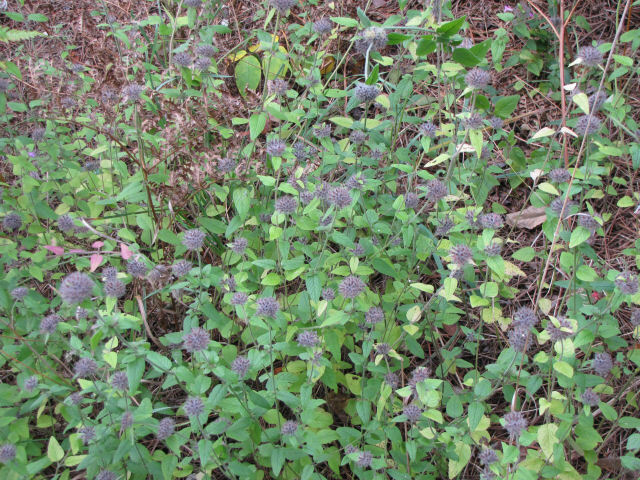 It's Hoary Mountain Mint, Pycnanthemum incanum. I had to decide between Hoary and Hairy Mountain Mint. But the clincher is that the leaves are definitely stalked. If I blew up one of the pictures a lot, the stalks were definitely visible, but it wouldn't make a great picture. It looks prickly! Actually, it isn't really; it's more soft than pokey. Look at all the silky hairs. I will try to get a picture of the flowers next year. I think I can approach this location from the other side and avoid the poison ivy. It rained most all day, so I was glad to have a leftover plant to show you! Last winter, Maggie and I walked to the headwaters of the little cemetery creek, and I said that I might take you back there in the summer. We did it today. It wasn't a stellar adventure, but it was someplace slightly different. First we walked to the section of cemetery that is across the highway. On that side of the road the creek forms a bit of a pond. Sadly, the water moves so slowly that it's mostly scummy in the summer. There were a few ducks there, but they flew away before I realized they were there. Sorry, no duck pictures today. The pond holds still better. The very next thing I learned about the creek on the other side of the road is that I shouldn't adventure there in the summer. No, no, no. We could not escape. 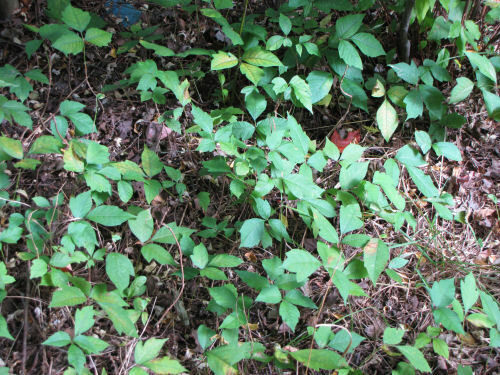 There was poison ivy everywhere. Stay tuned for the continuation of that story. 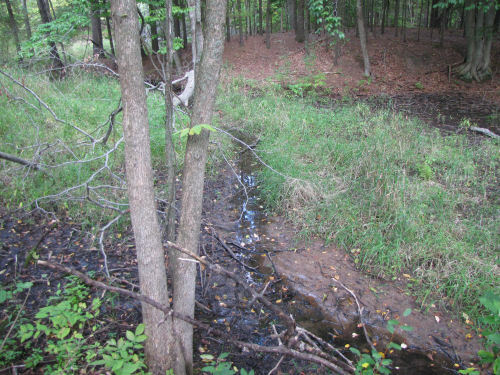 In the winter, the creek looked clean and inviting. Now, in September, it was just a muddy trickle. I could have been more interested in exploring, except for the PI everywhere. This picture is of the same section as in part 2 of the winter excursion (links at end). By now I was resigned to a full clean up later, but it still makes me feel creepy to walk through the three-leaved menace. 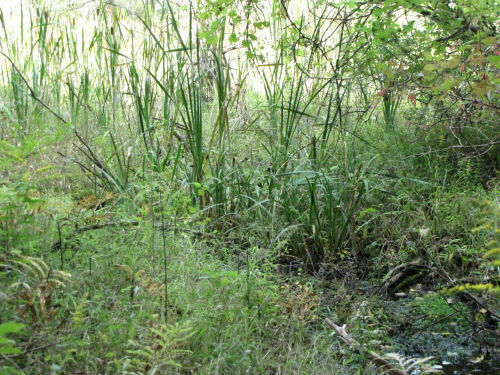 I crossed the creek and walked around in a red pine plantation for a few minutes, then came back to the creek and the cattail wetland that must be the headwaters. It was quite dry at this time of year. The ground was soggy, but not really pond-like, so I poked around there for a few minutes, but it was pretty much cattails and berry bushes. Not exactly fun to walk through. Then we pushed through a bunch more berry bushes, and I pulled the thorns out of my pants. Then we pushed through a bunch of autumn olive (you may recall that's on the bad plant list). Then we got into a more open field, back to the cemetery and home. Next item on the agenda- wash everything. I took a hose to Maggie, the leash, and to my feet. Maggie was surprised, but she didn't get as upset as I thought she would. 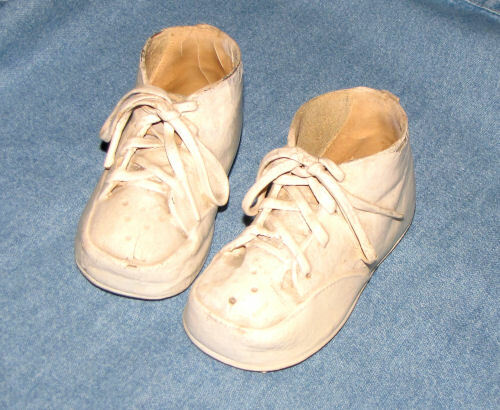 My shoes are drying in the kitchen. Next it was down to the laundry room. There I did the poison ivy strip into the washer, and then into the shower. I've made it through this season with only one case of PI in the spring. I wouldn't mind keeping it that way. We'll see. I see that this post gives the longer view than usual, and not so much of the details. Actually nature looks mostly like this. You have to go hunting for those details. I did see a couple of interesting plants (besides the PI). I'll show you tomorrow. This spring, Ellen gave me some garden plants. This one has been quite a mystery. It was given to her under the name of "Michigan Heather." I have scoured the internet since that time to try to find out what it could be, with no success. So I had to wait till it bloomed to be sure. I had a suspicion (and I was right), but that's like saying you knew something all along, but no one can believe you since you were never forthcoming about your guess until all was revealed. Here is the mystery flower! Do any of you gardeners recognize it now? 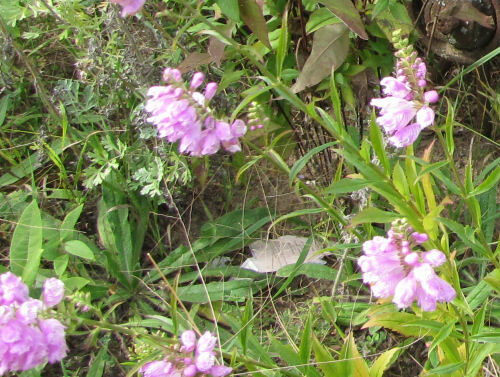 It has an odd little feature which gives it the common name of Obedient Plant. 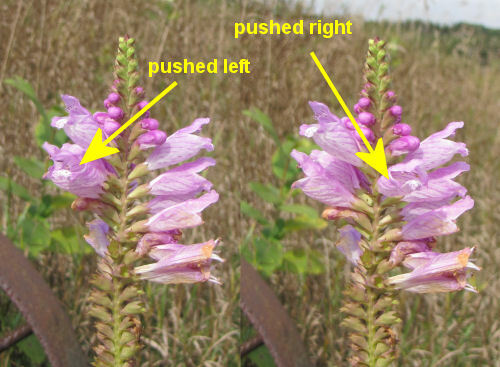 If you push a blossom from side to side on the stalk, it will stay right where you move it! It's as if each little bloom was mounted on a moveable joint of its own. If you find the right blossom, you can see that I've moved it in the mashup below. So there it is- Michigan Heather is Obedient Plant, Physostegia virginiana. 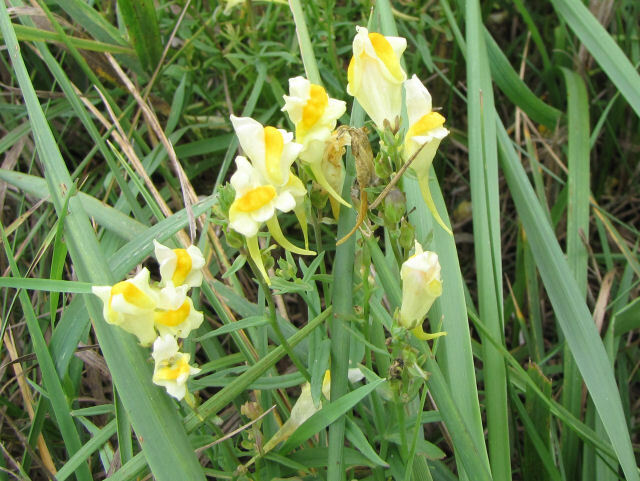 It's in the mint family, and can grow to 4 feet tall. Mine is about 2 feet- lousy soil. But I'll take it, it's blooming! I suppose I probably had an inner attraction to the boots. The girl in the statue is so confident and contented, without being aggressive, that I just like her! The little brother is all tuckered out and snuggled up to their dad, resting on the wheelbarrow. 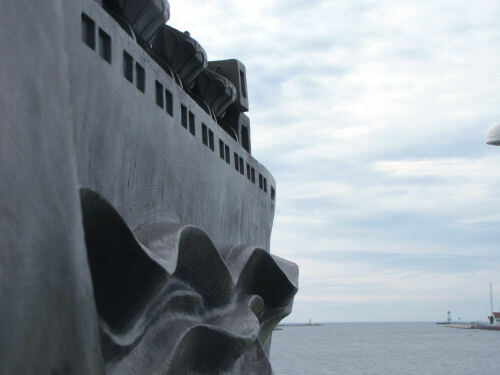 You may just consider this a big tease, but I'm just going to show you some close details of larger sculptures. 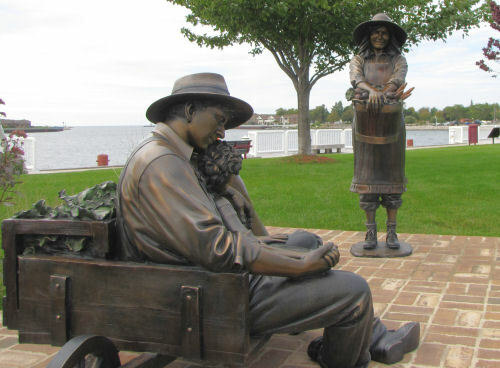 Om and I took a walk after church today and went through Ludington's Waterfront Park. 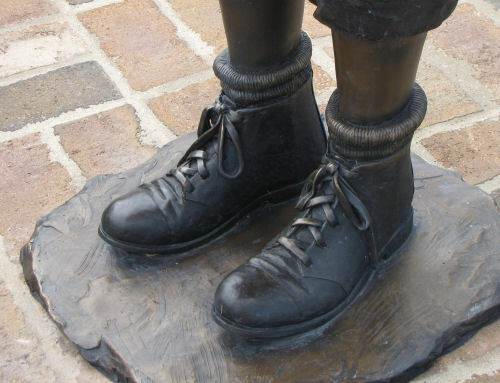 The city has been adding quite a sculptures related to local history over a number of years. I actually showed you one in Ellen and Joan's Urban Walk. I like it, but find it overwhelming. Since this is my blog... today, you just get some details. Enjoy them for whatever they are worth. If you REALLY want to see the whole things, tell me so, and I can oblige. By the way, can you figure out what the autumn background was built from? Is it a Karner Blue?